Matt wakes up in a hospital bed in Iraq. He remembers being on patrol, and he remembers an explosion, but he is blurry about what befell Ali, an orphaned Iraqi boy who had befriended him. In the hospital he can’t remember what day of the week it is, forgets words like “trash,” and gets headaches that are a “bolt of pain.” The medical staff tell him he has TBI (a Traumatic Brain Injury). Usually mild cases get better on their own, and he’ll be back with his patrol in a few days. Matt struggles to remember what happened, but at the same time is terrified to recall, in case he remembers the unthinkable – that he purposely shot a child. 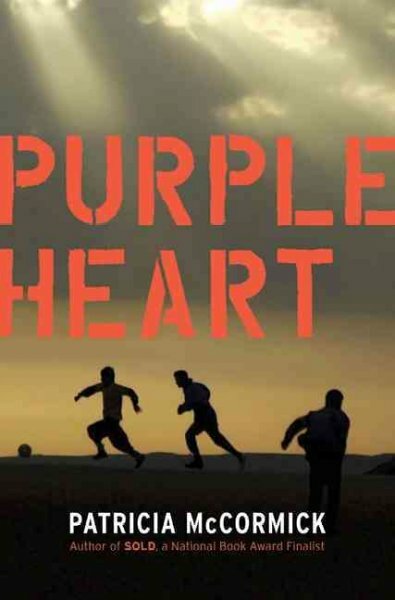 Purple Heart asks (perhaps unanswerable) questions about the morality of war and how it changes people. I recommend it for readers of other Young Adult books about war, such as Sunrise over Fallujah by Walter Dean Myers. Check the WRL catalog for Purple Heart. Reblogged this on Nuts about everything!.